Heart of Kensington Apartment in London is an apartment building. 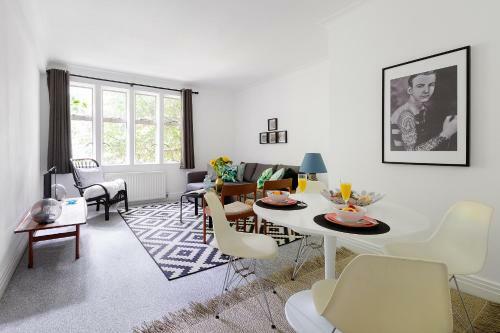 Offering garden views, Heart of Kensington Apartment is an accommodation set in London, 1.2 km from Royal Albert Hall and 1.7 km from Olympia Exhibition Centre. Free WiFi is available in the apartment, situated 1.8 km from Portobello Road Market. This apartment is fitted with 2 bedrooms, a cable flat-screen TV, and a kitchen with a dishwasher. Guests can also relax in the garden. Natural History Museum is 1.9 km from Heart of Kensington Apartment. The nearest airport is London City Airport, 19 k...m from the accommodation. Offering garden views, Heart of Kensington Apartment is an accommodation set in London, 1.2 km from Royal Albert Hall and 1.7 km from Olympia Exhibiti...on Centre. Free WiFi is available in the apartment, situated 1.8 km from Portobello Road Market. This apartment is fitted with 2 bedrooms, a cable flat-screen TV, and a kitchen with a dishwasher. Guests can also relax in the garden. Natural History Museum is 1.9 km from Heart of Kensington Apartment. The nearest airport is London City Airport, 19 km from the accommodation. When would you like to stay at Heart of Kensington Apartment?